ATLAS has published hundreds of studies of LHC data, with the Higgs boson discovery being perhaps the best known. Amongst the Run 1 searches there was one which stood out: the diboson excess. This was a search for a particle like a W boson but much heavier, decaying into a WZ pair, which then decay into leptons or quarks. 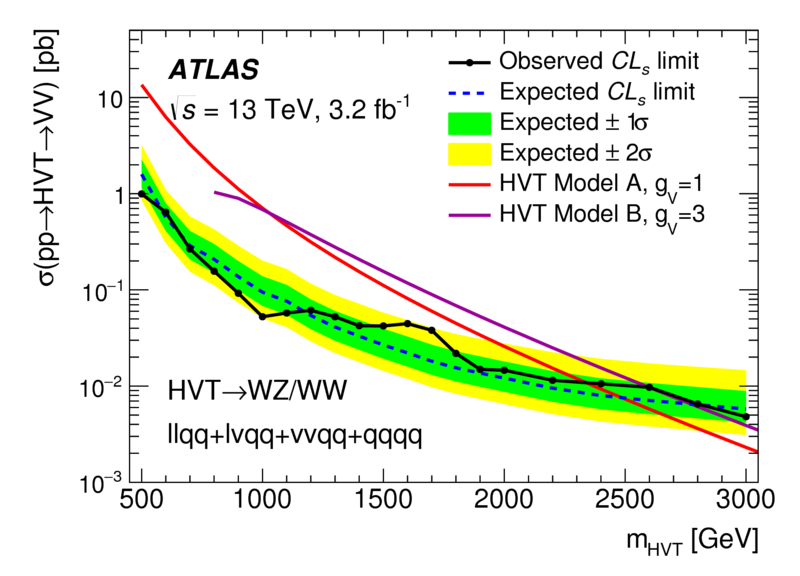 The data in the all-quark search showed an excess at 2 TeV, with a local significance of 3.4 sigma (2.5 sigma global significance when the “look-elsewhere” effect is considered). And at the other side of the LHC ring, CMS data seemed to show a small excess at the same place. This sort of search is rather new. At previous hadronic colliders, the decay of W and Z bosons to quarks has been extremely difficult to observe over the background of quark jets produced directly in the proton collisions. But at the LHC, hadronic boson reconstruction has become a standard tool. Could it be a 2 TeV W' boson? Maybe – but a combination of several W/Z boson decay modes dampened enthusiasm as the other channels showed no excess. Nevertheless, expectations for 2015 were high. The combined search that has just been published is twice as sensitive to a 2 TeV W' boson as the 2012 result. The increased LHC beam energy in 2015 meant that heavy objects would be made much more easily. Many possible decay modes of the W and Z were searched for – all but the fully leptonic mode, which is the rarest. The combined search that has just been published is twice as sensitive to a 2 TeV W' boson as the 2012 result. This combination shows a remarkable understanding of the 2015 data, with delicate analyses demonstrating excellent agreement in control regions. The plot shows the limit set as a function of mass compared with expectation – and at 2 TeV the limit is very close to that expected from background. There is no sign of the 2012 peak.